The location of Putih Satu is absolutely fantastic. 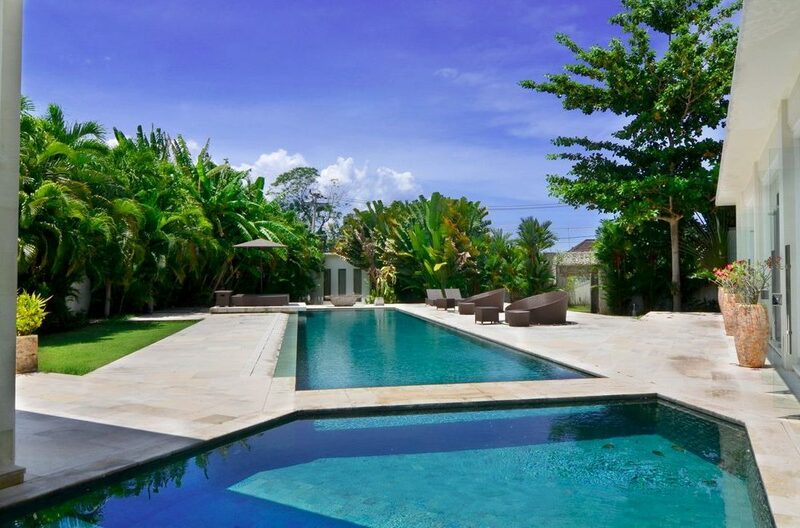 Canggu offers a refreshingly serene experience, especially if you’re used to bustling Seminyak. If charming ricefield views and a slower pace are up your alley, Canggu is the ideal place for you to take your well-deserved break. 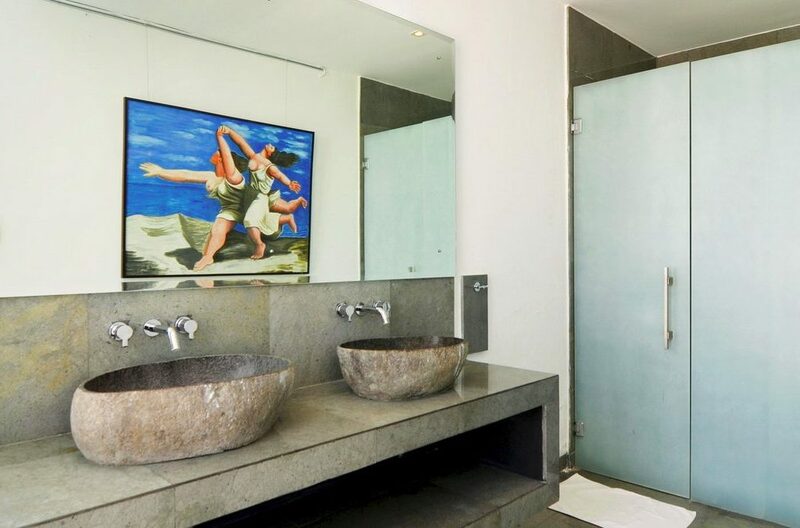 Surfers will love world-famous Echo Beach, which is just a short drive from Villa Putih Satu. There you can enjoy first-class waves, enjoy some delicious gelato at Gaya, or simply work on your tan. 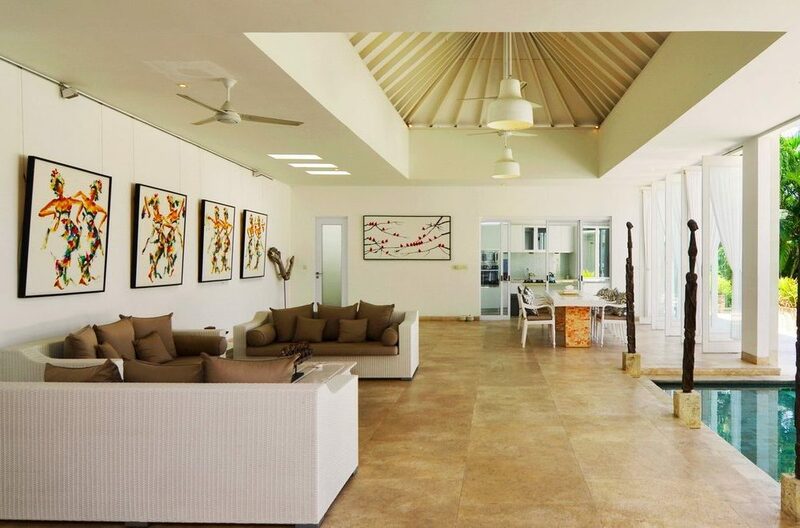 The living area boasts a spacious interior with high pavilion ceilings. The lounge comprises of three cozy settees arranged in an alcove for maximum comfort and intimacy. 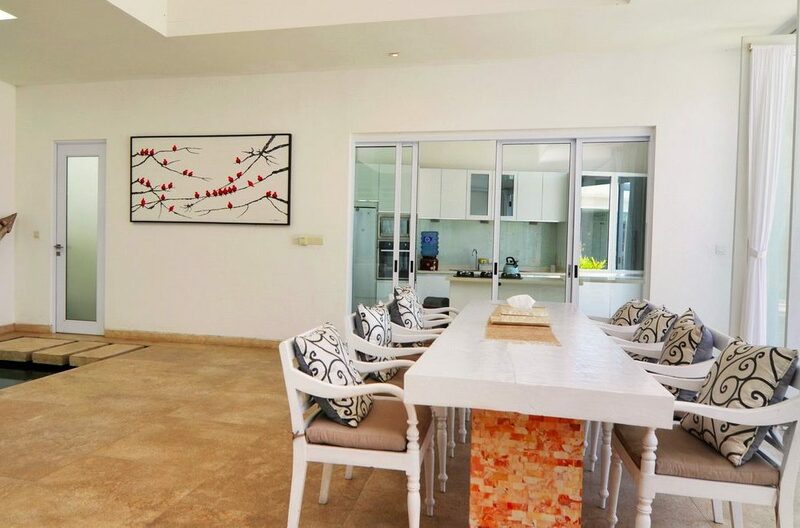 The living area has been furnished with a modern minimalist scheme, and has been tastefully decorated with Balinese ornaments and works of art. We recommend ordering in some food and spending an evening curled up on the couch watching a film on the LCD TV with your loved ones. The white stucco dining table to the right of the lounge comfortably seats 8 guests for some wonderful mealtimes. 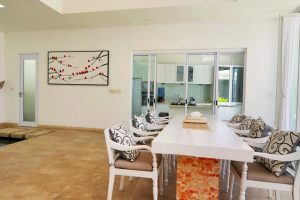 The swanky modern kitchen is located in an adjacent room and contains every appliance you could ask for. If you’re pining for some alone time, just make your way to the separate pavilion where you’ll discover another lounge. 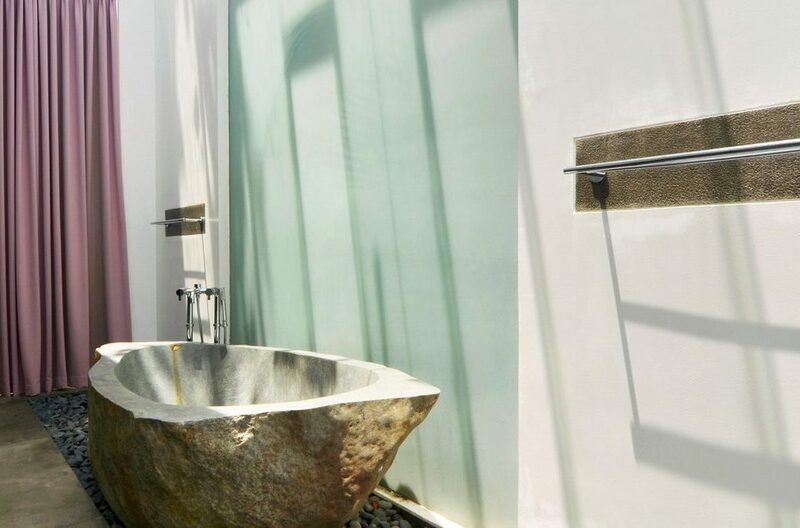 Enjoy air-conditioned comfort and some privacy in your own little haven. 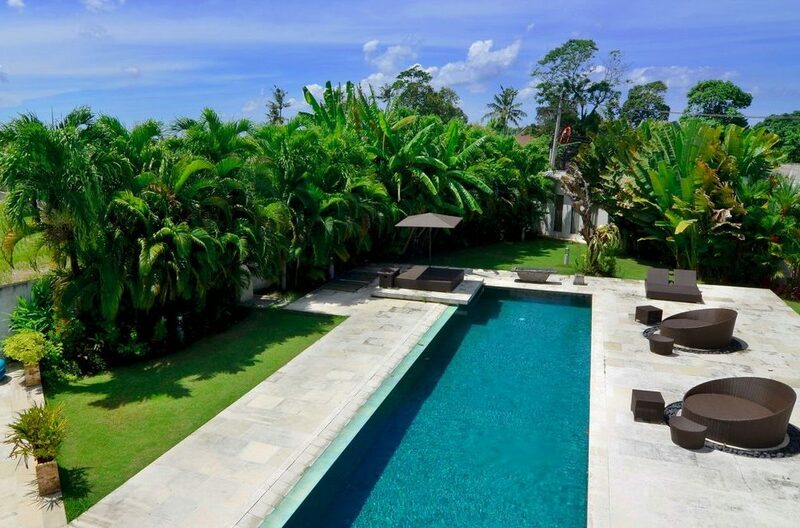 The outdoor area at Villa Putih Satu is quite spectacular. It’s a sprawling area containing a generously sized pool. There’s a second pool right next to it that stretches all the way to the edge of the living room. The lush lawn area is flanked by tropical palms that sway in the afternoon breeze. After your morning swim, you can make your way to the pool deck and kick back on one of the deck chairs that we just know are calling your name. There’s also a shaded area at the far end of the outside area where the children can play. 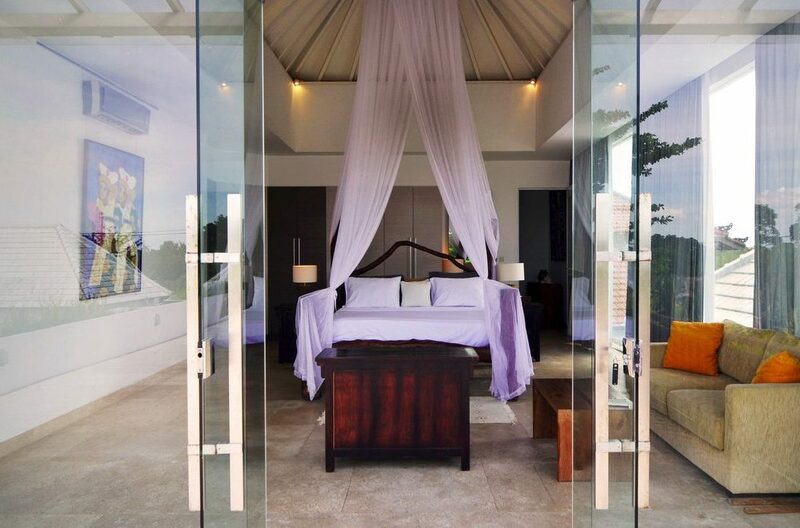 Housed in Villa Putih Satu are three elegant ensuite bedrooms. 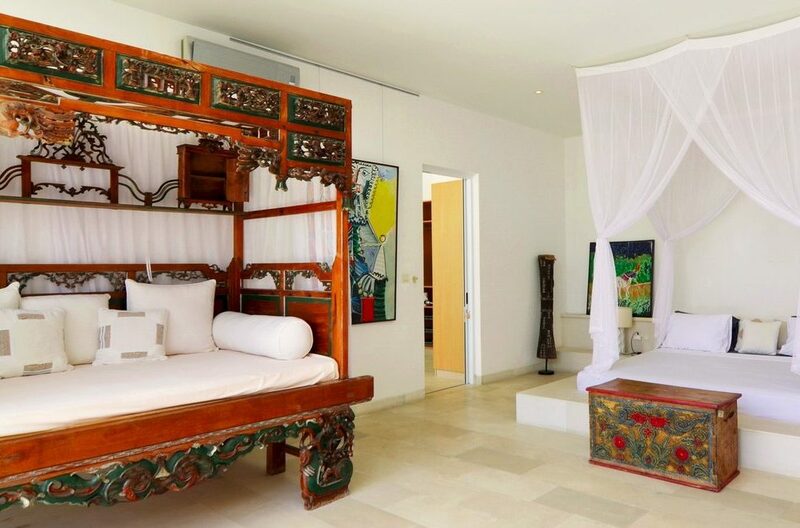 The bedrooms carry the same fusion of modern minimalism and Balinese motifs as the living area. 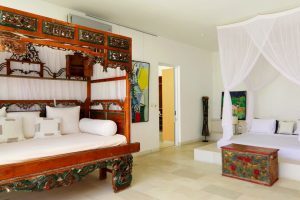 Two of the bedrooms contain plush king-sized beds dressed in soft white linens. 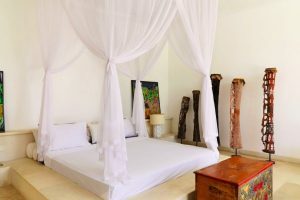 On the upper floor, you’ll find the master suite, with an impressive bed mounted on a marble slab, as well as a beautiful hand-carved wooden day bed for afternoon siestas. 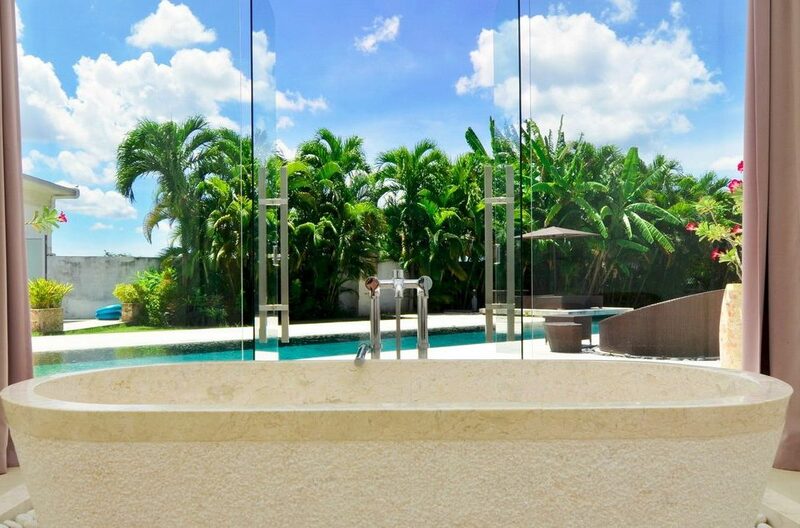 The room also features a private sun deck and huge glass walls which allow an abundance of natural light and provide stunning views of the sparkling pool. 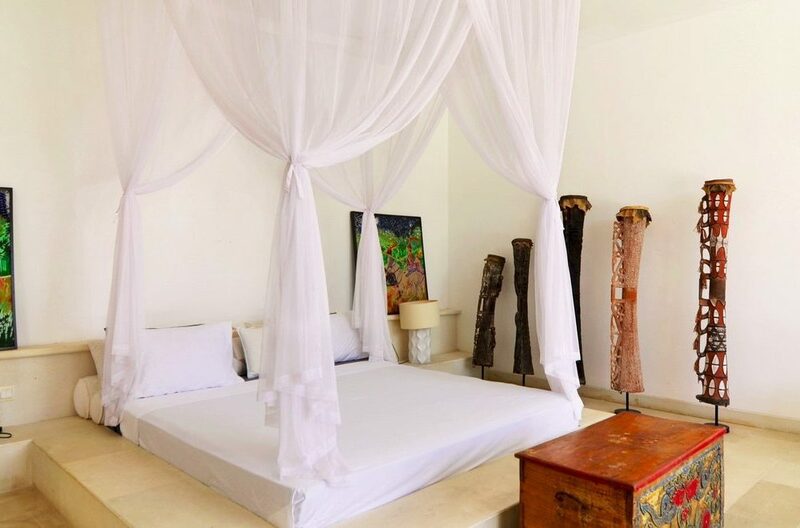 All of the bedrooms feature mosquito nets, are fully air-conditioned and come with stunning ensuites. The second bedroom has been decorated with vibrant local art. 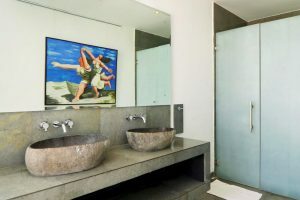 The accompanying ensuite to this room contains a large terrazzo tub that’s perfect for unwinding in the evening with a glass of champagne – just ask housekeeping if you’d like a petal bath drawn for extra luxury! The last suite is a room with a twin bed configuration suitable for children. It opens onto the spacious garden. At Villa Putih Satu, no request is too great. 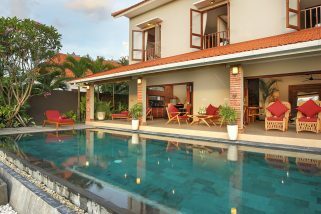 Your villa manager will ensure that you’ve settled in nicely and will answer any queries you may have. He can help you organise excursions and day trips as well, so don’t hesitate to ask. You won’t have to lift a finger during your stay, as a housekeeper will visit daily and ensure that the villa remains pristine. She will change your linens and replace any amenities you may require. The outdoor area is maintained by a pool attendant and gardener. 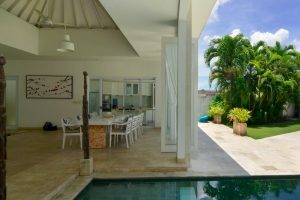 You’ll find that all members of staff at Villa Putih are warm, discrete and highly professional. 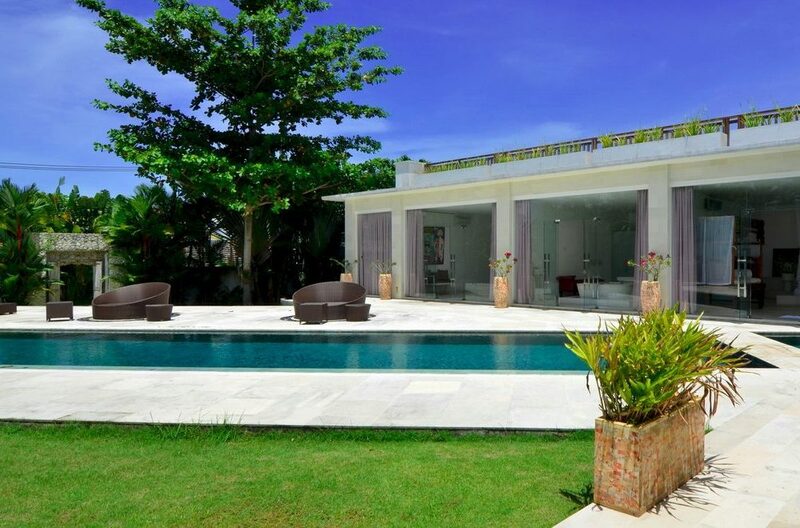 Frankly, Villa Putih couldn’t be in a better location. You’re only a stone’s throw away from world-famous Echo beach and the many cafes, warungs and restaurants in the area. There’s Echo Beach Seafood restaurant if you’re in the mood for freshly-caught and barbecued seafood. If not, try out one of the numerous restaurants in Canggu. La Finca, Slow and Ji are just some of the upscale dining establishments that Canggu boasts. If you’re looking for something more laid back, head over to Old Man’s for a brew. But keep in mind that it can be rather rowdy on Wednesday and Sunday nights. If you’re in the mood for some debauchery, then that might suit just fine, and you can head over to Sandbar at Echo beach to keep the night going. During the day, visit Therapy or Goldust for some top of the line pampering. Canggu is also home to many boutiques and stunning homeware stores along Jl Pantai Berawa and Jl Batu Bolong. And when you’re parched from shopping, just pop into one of the many wonderful cafes such Milk and Madu, Peloton or Vida for an artisanal coffee and a delicious little lunch.